Discussion in 'Apple iPad News' started by iDan, Jun 28, 2011. 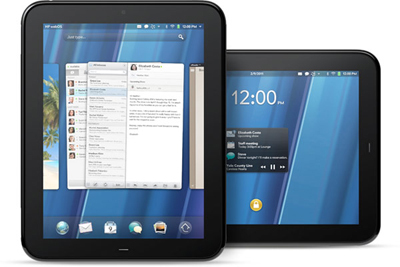 Hewlett Packardâ€™s new 9.7â€ tablet will soon be launched carrying the newest WebOS platform in a fight to close the gap between them and all other tablet manufacturers, especially Apple. Although the California-based company also released last year the HP Slate 500 PC to stop the iPadâ€™s accession, and although it was superior in technical specifications, just as the other manufacturers it failed to achieve this feat, remaining way behind Appleâ€™s creation in sales as well as global market share. It is clear that the TouchPad, with its 768x1024 resolution, TFT capacitive touchscreen, 1 GB RAM and 16/32 GB storage, powerful 1.2 GHz Scorpion dual-core Qualcomm APQ8060 Snapdragon chipset processor as well as accelerometer, gyroscope sensor, oleophobic scratch resistant surface and a 1.3 MP camera, has beaten Appleâ€™s second tablet creation in the horse race. However, the distinct difference is its operating system. While the Slate carried Windows 7, the TouchPad will come fitted with WebOS 3.0, a platform HP has been hard at work with. Moreover, HP has expressed its support for homebrew, considering that â€œall the homebrew community allows you to go off the beaten path if you want and explore other areas.â€ However, while HPâ€™s initiative is a breath of fresh air, it remains to be seen whether its tactics ensure the TouchPadâ€™s survival in the ongoing tablet war.